▪Clicking on the Create Quote List icon in the ribbon, and then use the search criteria to narrow your choices. From the search results, select the quote you want to create a job from. 2.Once you have brought the quote up on screen, click Create Job in the quote footer. 3.The Job confirmation box will appear. 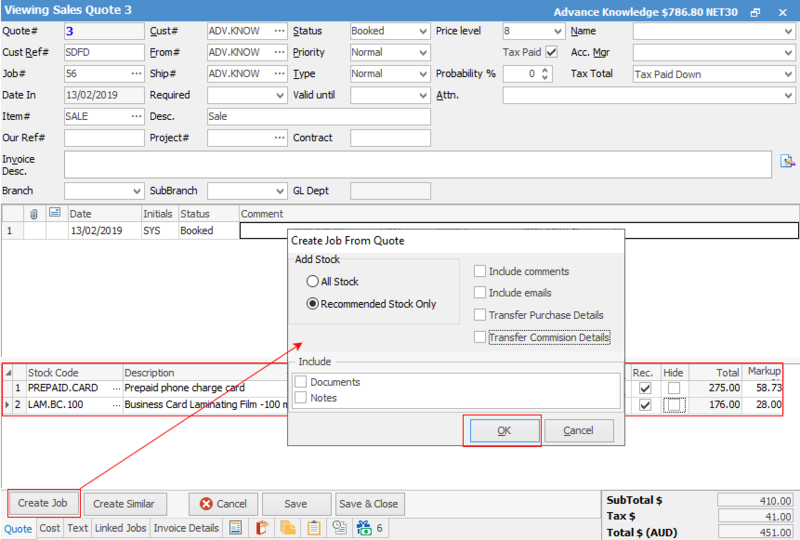 You need to select either All Stock, or Recommended Stock Only, to bring across onto the job, and also tick if you want to bring any of the other fields across from the quote to the job. Then click OK to confirm your selection, and that you want to go ahead and create a job from this quote. 4.The job Information box will appear, informing you that a new job has been created, and indicating the new job number. Once you click OK, the job you have just created will open on screen. All stock, pricing and any of the other fields you selected will now appear on the job. You can remove or add stock to this job, as required. 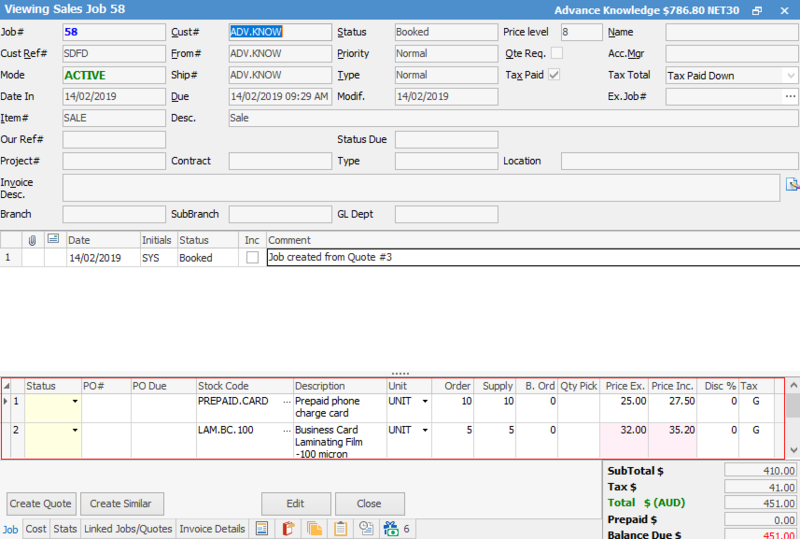 If the Cost tab has been populated with Vendor and stock pricing, this will automatically transfer across to the job and populate the job stock grid, as well as the job Cost tab.. There is a tab within Jobs called Linked Jobs. When a job is created from a quote, a link is placed in the Linked Jobs tab of that job, where you can right click to display the quote. In a multi-user environment where others could be adding Jobs at the same time, it's a function of Jim2 to monitor the sequence of unique Job numbers issued at all times. If a user creates a Job from a Quote and then wants to Cancel that job for whatever reason, they may only do so by applying a Job Status of CANCEL to that Job. Jim2 will time/date/initial stamp the cancellation, log the history of the cancellation, and lock the Job from further edit. It will now only be available to view.